This book provides the reader with inspiring, heartfelt diary extracts that gives a glimpse into a mother’s world in managing a son with ADHD. The author offers candid insights into her son’s behaviours, sharing how they had an impact both emotionally, physically and socially. She shares her thoughts about the subsequent assessment process and diagnosis, and the management strategies initiated, including the dilemmas faced at each juncture. Often left feeling frustrated, embarrassed, guilty and exhausted, she demonstrates through a mother’s unconditional love, empathy and patience that things can improve. 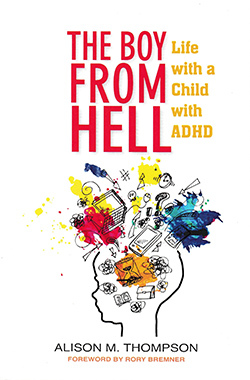 Her comprehensive excerpts conclude by offering a perspective on life with ADHD, firstly from a sibling’s perspective, in sister Katie, and second through Daniel himself. This book is easy to read, refreshingly honest and a fantastic resource offering helpful advice and support for parents, professionals, friends and families. A mother’s experience of living with a child with ADHD.